Wash broccoli, trim outside layer on stems, and cut broccoli florets and stems into small bite size pieces. Toss all the salad ingredients in a medium large bowl with the exception of the cashews. Mix dressing ingredients and pour over broccoli salad - toss to coat. 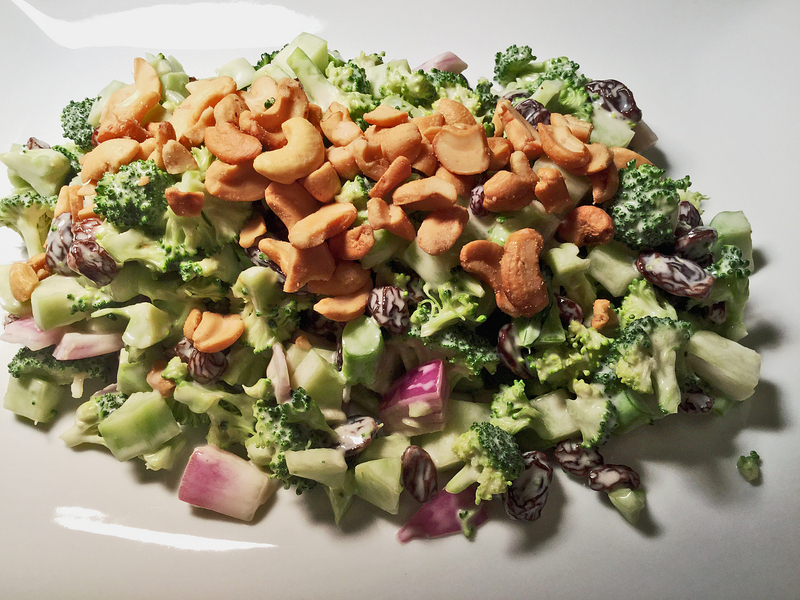 Sprinkle cashews as a topping over the salad. Toasted sliced almonds are also excellent as a topping to this salad. *If you use red onion for this salad, soak the chopped onion in a bowl of water for 15 minutes to reduce the strong flavor of the onion. Drain the water off and add the onion to the salad.